BV Solid Cable(ZR-BV、NH-BV)_Guangdong Zhujiang Wire & Cable Co., Ltd. This cable is suitable for AC rated voltage 450 / 750V and below, requiring flame occasions electrician, instrumentation, telecommunications equipment, power equipment and lighting circuit fixed laying. 1. Using high quality oxygen-free copper and environmental PVC for manufacturing, the performance indicators are in line with national standard: GB/T5023.3—2008/IEC60227—3:1997. 2. Acid and alkali resistance, oil resistance, moistureproof, mouldproof. 3. There are types: ordinary cable, flame-retardant cable, fire-resistant cable. 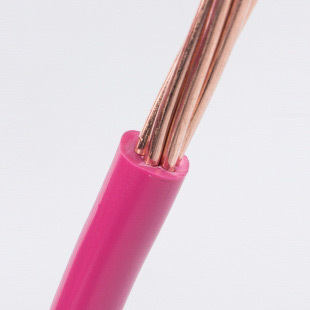 Full name of BV Cable is Copper conductor PVC insulated wire , namely general purpose single-core hard conductor non-sheathed cable , which is an ordinary insulated wire used in our daily life, such as ordinary insulated wire, home cable, which is the most common type. Resistant to acids , oil, moisture , mold and so on. According to sectional area of conductor, BV wire can be divided into three types: 01, 05, 07, all of these are with different features. According to different performances, BV cables can be classified as insulation cable, flame-retardant cable, fire-resistant cable. How to select safe high quality wire?